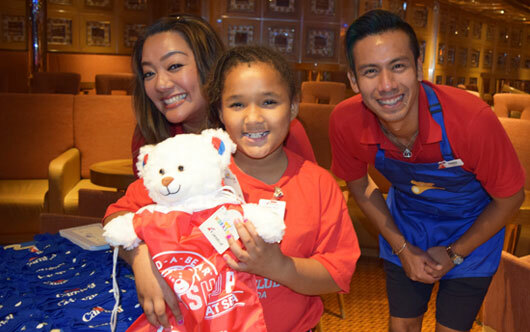 Carnival Cruise Line recently hosted a Build-A-Bear Workshop event that provided more than 100 kids from Brevard, Fla.-area Boys & Girls Clubs with a day of fun aboard the Carnival Magic in Port Canavera. Coinciding with Build-A-Bear’s 20th Birthday, the event offered kids a chance to make their own cuddly bears that could be customized with a colourful Carnival T-shirt and other accessories. Each bear came with its own “birth certificate” and a special logoed drawstring bag for safe keeping. Kids also enjoyed bear-themed sweets and a pizza party along with tours of the massive 130,000-ton Carnival Magic. The day culminated with a $10,000 donation from Carnival to the Boys & Girls Clubs. ‹ On Track With Barbados!